Looking for ways to optimize your business and avoid unnecessary headaches? 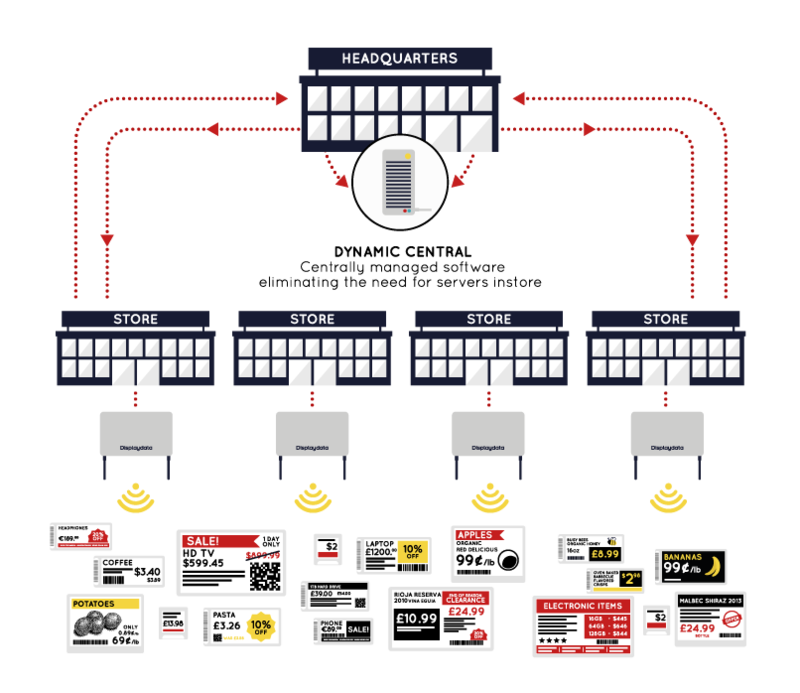 Now you can manage all of your barcode label information across every retail store or manufacturing location in the world with DisplayData. Electronic Shelf Labels (ESL’s) give you the power to change promotions, pricing, bin numbers, bin quantities, images and more across any specific item or every one of your items, all within seconds from your computer. Imagine the cost savings in labor alone of not having to send employees aisle by aisle changing barcode labels or manually adhering the latest promotional offerings to your goods. You also eliminate the printing, the errors and the cost of media. The best part though, is the system is tied to your internal database, so ESL update with real-time information the minute its changed! No other solution in the market today allows you to manage all of your locations from your own server. The other solutions require a server on premise at the location of your labels, driving your costs in hardware (servers) plus maintenance and support to exorbitant levels. The Displaydata solution is not only delivering the highest quality electronic shelf labels (ESL’s) available in the industry today but has also made the remote management of your data as simple and cost effective as can be. Displaydata offers many sizes and options when it comes to your ESL choices. Electronic Shelf Label Sizes range from 1.7″ to 12.5″ in size. There are also 3 Color options: Black and White, Black, Yellow and White or Black, Red and White labels. Use your existing label designer software or use the Displaydata designer tool. Either way, you can create the look and feel your business needs. Contact us at 877-484-8187 or [email protected] or visit our ESL web page: https://valutrack.com/solutions/industry-solutions/warehousedistribution/#electronic_shelf to help you make the right choices for your business.